Instagram has quickly grown to become one of the world’s largest social media platforms, with over 1 billion active users and plans for expansion over the next few years, it’s not going anywhere soon. Its ever-increasing user count and audience size mean Instagram has become the place to be for businesses looking to grow their social media presence. 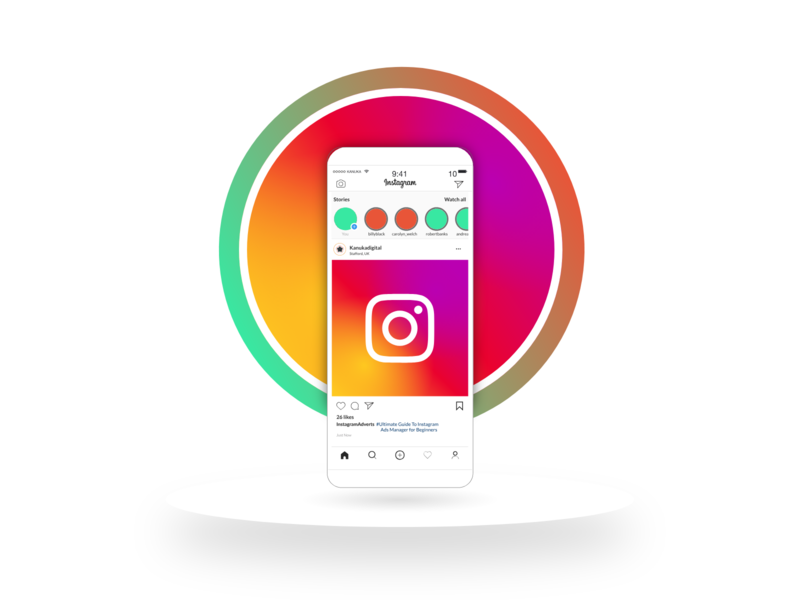 Instagram’s variety of ad formats allows advertisers to get creative and take advantage of influencers’ powerful reach to target new audiences. 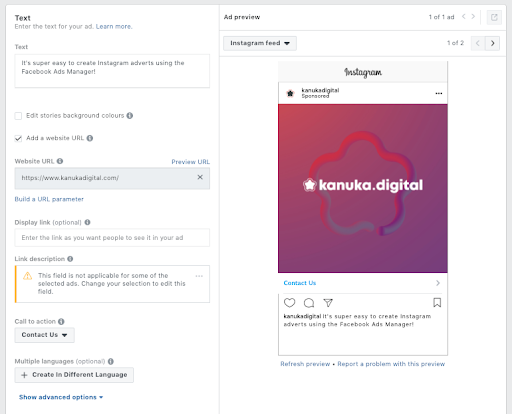 We’re taking you through our Beginner’s Guide to Instagram Ads Manager, so you can get started advertising on Instagram. You’ll learn how to easily publish successful adverts to help boost sales and reach new audiences. Instagram is owned by Facebook so to get started you’ll need to log into Facebook Ads Manager to create, monitor and manage your Instagram ads. Make sure that the Instagram account you want to start advertising from is added to your Business Manager or connected to your Facebook page. If you don’t have an Instagram account, then you can still advertise on Instagram using your Facebook page instead. 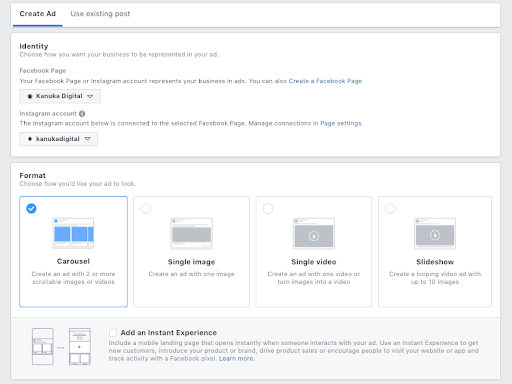 Log into Facebook and head to the Ads Manager section, from the dropdown menu in the top righthand corner. Here, you’ll see any existing campaigns listed and be able to view their performance. 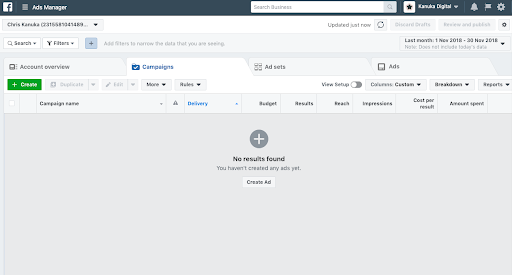 If you don’t have any existing campaigns then this section will be blank, so click ‘Create’ to get started. This guide will take you through the in-depth ‘Guided Creation’ process. This is generally the default and most popular approach, particularly for beginners and users creating ads for the first time. You’ll automatically be taken through the guided tour, allowing you to select the best advert type, objectives and budgets to meet your business needs. However, if you’re in a hurry then select ‘Switch to Quick Creation’ to set up your adverts quicker. Objectives are organised into three categories; awareness, consideration and conversion. Each category has a range of campaign types, with different focuses to suit all kinds of goals. A new business is likely to run an awareness campaign, focusing on “Brand Awareness” to get their name out there. However, an established business trying to increase the number of people buying their products might choose a more sales driven campaign such as “Conversions”. Note that not all campaign types are eligible to be shown on Instagram Ads. Make sure to choose one of the following; Brand Awareness, Reach, Traffic, App Installs, Engagement, Video Views or Conversions. Now you’ve selected your objective and campaign type, you need to name your campaign. Make sure to choose a logical campaign name containing the objective so you can easily identify the campaign purpose later on. 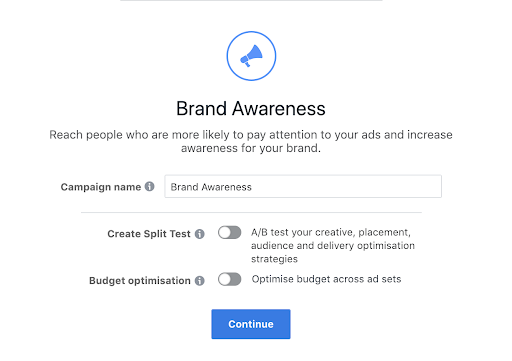 At this stage, you can also choose whether to run an A/B test and whether you want Facebook to automatically optimise your budget across ad sets. A/B tests are particularly useful, allowing you to test how well your creatives work and what your audience respond well to. By running two different creatives within the same campaign across the same audience, you can see what stands out best and resonates well with your audience. By allowing Facebook to automatically optimise your budget, ad spend is spread evenly across all adverts. This helps to get the best results possible, as budget is allocated to the best performing audiences or ads. The next stage is to create an “Ad Set” which will sit within the campaign. At Ad Set level you’ll create an audience to target, set a budget and ad schedule as well as select a bidding strategy. Your audience is where you define the types of people you want to see your ads. You can narrow this down by targeting people in specific locations, within a certain age range, a particular gender or who speak a specific language. You can build on these factors by targeting people with certain behaviours or interests relevant to your business and target audience. Facebook generates an estimated audience size, showing you how broad your audience is and what the potential reach of your ads could be. This enables you to get an insight into what results you could expect from your ads. Tip: The broader your audience targeting, the greater the potential reach for your campaign will be. The next step is to select where you would like your adverts to show – your placements. This ensures your ad pops up in the right place on the right platform. 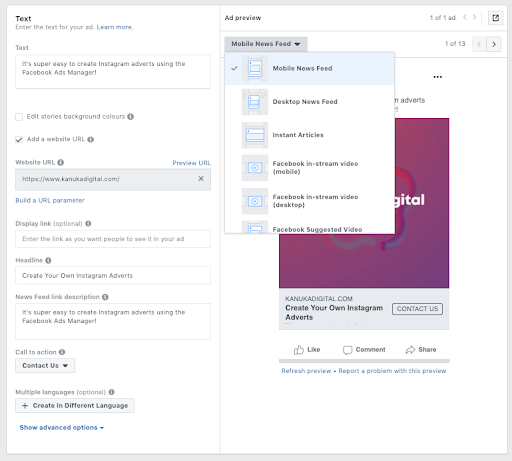 By selecting ‘Edit placements’ you can choose exactly where on Facebook, Instagram, Messenger or the Audience Network you want your adverts to appear. If you only want to advertise on Instagram, then you should deselect all of the options apart from ‘Instagram Feed’ and ‘Instagram Stories’. 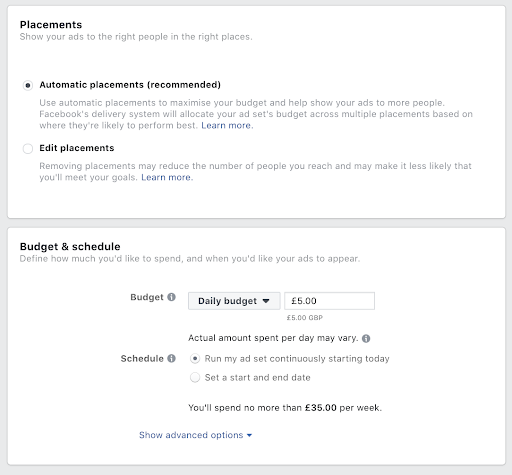 Here, you’ll also define your daily budget (how much you want to spend) and ad schedule (when you’d like your ads to appear). You can choose to either set a maximum daily budget, or set a date range for your campaign and choose an overall budget. You can choose to let your ads run 24/7 or select certain times of the day or days of the week to run them. This may seem like a small detail, but the way your ad sets are named is extremely important. Using a random, meaningless name will make it harder for you to manage and differentiate your adverts and see which ones are performing well. This could represent a mobile-focused video ad, targeting users in Australia aged between 18 and 24. First, in the “Identity” section, make sure you select the correct Facebook page and Instagram account to run your ads from. If you’re creating your ad from scratch, select your ad format choosing from either a carousel, single image, single video or slideshow, depending on the creative that you want to share. If there’s a post on your Instagram or Facebook account that you wish to use as your ad, then switch to the ‘Use existing post’ view and select the post from the list. Fill in all the fields of the ad creation form, making sure to include engaging ad copy, eye-catching creative and add a link to your landing page. Select a call-to-action from the drop down, which will encourage users to click-through to your site from your ad. There are lots of options for a call-to-action, from ‘Contact Us’ and ‘Learn More’ to ‘Shop Now’ so choose the message most relevant to your ad and business goals. Once you’ve filled in the necessary fields, you’ll be able to preview your ad before you set it live. You can then make tweaks to your copy or design if required. Tip: Have a look through the different preview modes to see how the ad will look in different placements. Make sure you’re happy with how it looks on mobile, desktop, in-feed, in your Stories and more. Step 9 – Review and set live! Once you’re happy with how you’re ads are looking, you can then “review” your entire ad creation or alternatively “Confirm” you’re happy with the edits. Once you’ve hit ‘Confirm’, your adverts will go through the review process to make sure they comply with Facebook advertising standards. The review process typically takes anywhere from a couple of hours to 2 days. After they’ve been through the review process, your ads will be live and start to show in your audience’s feeds. 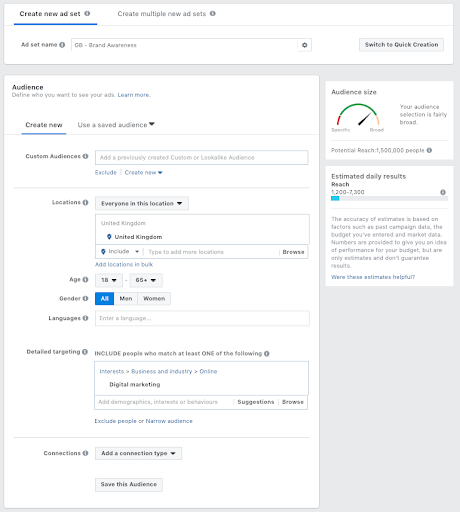 Facebook and Instagram will monitor what type of people are interacting most with your adverts and automatically adjust targeting to ensure that you’re reaching the best users possible. Hopefully, you’ve now got a better understanding of how to create powerful Instagram Ads using Facebook Ads Manager. 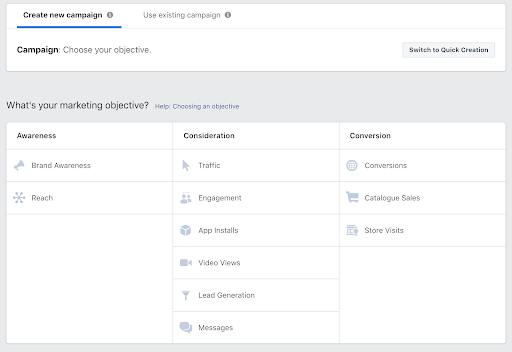 To make life a little easier, Facebook Ads Manager provides helpful tips to guide you throughout the process, so refer to these hints if you’re unsure of what to do next or which options to choose. Remember, it’s important to monitor ad performance and spend, to ensure that budget isn’t overspent. Make adjustments based on the best performing ads or audiences and check regularly for any comments and interactions. This guide was created by Kanuka Digital but originally posted over on the DashThis blog. Check it out – Beginner’s Guide To Using Instagram Ads Manager.